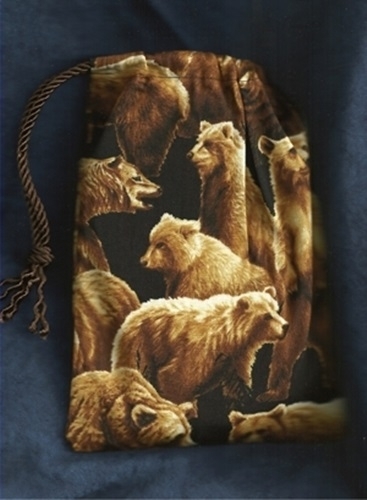 Wide Tarot Bags - Bear Mountain Wide Tarot Bag - Tarot Bags, Tarot Cards, Cloths, & More! From modern literature to the oral tradition of the ancient bards, humankind has heard stories of bears and their influence upon us. For many people they are the preferred spirit animal. If bears are your power animal or totem, then this is the bag for you. There are all sizes of ursus on this fabric. Because there are so many bears, each bag will likely have a different positioning of the animals. Every bag is literally covered with bears. The background of each bag is black and the ursidae are illustrated in various shades of brown from golden tan to dark brown. Size: Wide, approx. 5-3/4 W x 8-3/4 H. Fits tarot sets that include a standard-size tarot deck plus a book that is no larger than 4-3/4 wide by 7 high--or an oversized size oracle/tarot deck without a book. Pictures: First pic. shows sewn bag; Second pic. 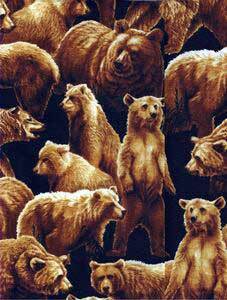 reveals variety of bears on fabric.